Holiday shopping can be overwhelming and expensive. So to save you time, stress and a few bucks, we’ve pulled together a list of gifts for under $25- all found locally! Even better, you can save at all these spots using your Shop Durham card. Our Shop Durham card gets you freebies and deals at local businesses all over Durham like Cocoa Cinnamon, Locopops, Joe Van Gogh, Funny Girl Farm, and more. Get a free churro with a drink purchase at Cocoa Cinnamon, 50% off tours at Durham Distillery, a free cup of coffee at Durham Co-Op Market, 10% off at Kaffeinate every visit, and many more. It’s only $15 and it lasts all year long. Even better, $1 of your purchase goes to local non-profits. The 2019 card features original artwork by Papermill Creative and is available now! We are so excited and honored that Papermill Creative created the incredible artwork for our 2019 Shop Durham card. You can find their art online and at local markets. They feature towns around North Carolina in their work and you have to get this amazing Durham print for a friend (or yourself)! Note: This print is $30 online, but we think it’s totally worth it. It’s available at local markets for $25. Plus, they have lots of cute greeting card options for $22. This is the perfect gift for any coffee lover. 4th Dimension Coffee is Cocoa Cinnamon’s very own coffee brand and you can order online or grab a bag at any 3 of their Durham locations for between $13-$21. Big Spoon Roasters makes handcrafted nut butters right here in Durham. You can get a jar for between $11.95 – $13.95. Or grab a gift set with jelly for $25. Sarah creates amazing handmade and hand painted signs that will brighten up any room. This North Carolina sign is only $19.80. Local pickup in Durham is available. Don’t forget your pup! Barley Labs makes their own all-natural dog treats out of barley that is recycled from the beer-brewing process. Packs are only $6.99 each or you can get a “Beer & Dog Lover Gift Set”. It includes 2 bags of dog treats and a pint glass for $18.99. Pine State Flowers is the state’s only flower shop with completely local sourced flowers! They have so many houseplants and adorable little gifts available. Not only does Little Homestead Farm soap smell amazing, it only has a small handful of natural, readable, safe ingredients. Only $6 each or you get get a whole gift box for $20 with soap, bath bomb, and a lotion bar. All of Strickly Handmade’s signs and art are made from 100% reclaimed wood. Signs are only $15 and these awesome bottle openers are $20. You can order one by emailing them at t.m.nicoletta@gmail.com. You may have spotted Caballo Rojo Coffee at the Farmer’s Market, tasted their coffee at places like Kaffeinate or even in the ice cream at The Parlour. If you haven’t- trust us, it’s REALLY good. Pick up a couple of bags for the local coffee lover in your life. How beautiful are these? The Durham Candle Company specializes in small batch, high quality beeswax candles. A set of 8 rose candles is only $18.95. Lo & Behold is a 100% natural and small batch body care company right here based in Durham. All their products are 100% natural and handmade, free of parabens, sulfates, petroleum, synthetic ingredients, artificial fragrances and artificial preservatives. They have plenty of gift sets under $25! Tom & Jenny’s Candy makes sugar-free, gluten-free caramels with nothing artificial. These caramels are the perfect combination of healthy ingredients and amazing flavors. They make the perfect stocking stuffers! Durham Handmade Soap makes natural soaps in small batches right here in Durham. The bars are $6 and soy candles are $14. I’m drooling just thinking about this toffee. Be sure to order some online before they sell out. It’s only $12.49 a bag. Gunter’s Greenhouse carries these adorable ready-to-go planters filled with succulents. The best part is that they’re low maintenance, so it’s perfect for that plant lover that is also a plant killer (Like me!). Joe Van Gogh has a special Home for the Holidays coffee blend. Even better, for every bag sold, they will donate 50 cents among Habitat for Humanity in Durham, Greater Greensboro, Orange, and Wake counties. Make sure to check out Rachel of Bullpin Apparel for the most adore-a-bull outfits! From cute onesies to toddler tees, they’ll have a unique outfit for your kiddos to rock. This mini Crew-neck tee is screen printed with love by hand, just for your little guy or gal! Only $23 for this tee! Becca of Grace Paper Co. creates amazing pieces and we especially love this Bull print to show our love for Durham! Click the photo to get this piece for $25 or visit Grace Paper Co. for more products. Cr2F has amazing prints, wall art, personalized art prints, stickers, and mugs. Lots of Durham themed options available or get a custom piece made for someone special. A perfect gift for anyone! This Dirty Durham print is only $15! 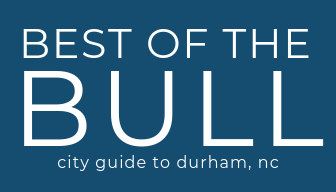 We can’t agree more with Dirty Durham’s motto. Keep it a little “dirty” with their t-shirts for $20. Check out their shop here. All of Durham Original’s cotton is organically grown right here in the USA. For their tees choose from 100% organic cotton or a 50/50 blend with recycled plastic bottles! These reusable food bags make a statement- in fashion and sustainably. Only $15. We’ve said it before and we’ll say it again, guys can be pretty tricky to shop for. If you’re coming up short in the idea department, you’re in luck. Stz is a local company with some amazing gear for guys. Stop by their location off Foster St to get a t-shirt or hat. Most are priced $20-25. You’ll find Hometown Apparel on 9th Street with tons of great Durham themed clothing, mugs, stickers, dog bandanas, and more. They even do custom tees. There’s something for any Bull City lover in your life! We can’t wait to hang this Durham city map art print on our wall. They are printed on museum-quality, acid-free matte paper, and available in both color and monochrome. Get the Durham map print here. Durham Garden Center is your one stop for plant lovers. They have pothos hanging baskets for $18.99 and planters succulent mixes for just $19.99. You’ll find this local skate shop tucked away next to Joe Van Gogh. They have plenty of tees and hats for $25 for the skate lover in your life. Cameron of Nouveau Central curates an impressive collection of reclaimed, upcycled furniture, hand painted pillows, and more. These custom keychains from Nouveau Central are only $10! You can customize them with your area code and state. 4″ Durham Skyline stickers for only $3.50! These stickers will only be available in the Shop Durham store.